Last week I received a nice comment from a fellow food blogger (Rice Palette), I’ve decided to try one of the recipes from the site, and oh my! What a wonderful and healthy dish it turned out to be, Kudos to you Rice Palette! We are going to start off by marinading the ground pork with the salt, 1/2 teaspoon of sugar, 1/3 teaspoon chicken broth mix, garlic powder, 1/2 teaspoon of cooking oil, 1 teaspoon of soy sauce, 2 teaspoon corn starch and 1 tablespoon of the chopped scallions. Mix well to have it nice and uniform. 1. In a small pot, boil the tofu for about 5 minutes (or until it floats). Drain the tofu and let it cool for about 15 minutes. Cut the tofu into bite-sized cubes. 2. In a small sauce pan, heat the rest of the cooking oil, then add the garlic and ginger. Next, add the black bean garlic sauce, along with the rest of the sugar, chicken broth mix, and corn starch into the pan. Mix well and set aside. 3. Spread the tofu pieces evenly on a fairly wide plate (or bowl). This plate will be placed in a steamer, so choose an appropriate sized plate. Add the rest of the soy sauce over the tofu. Next, spread the sauce mixture prepared from Step #2 over the tofu. 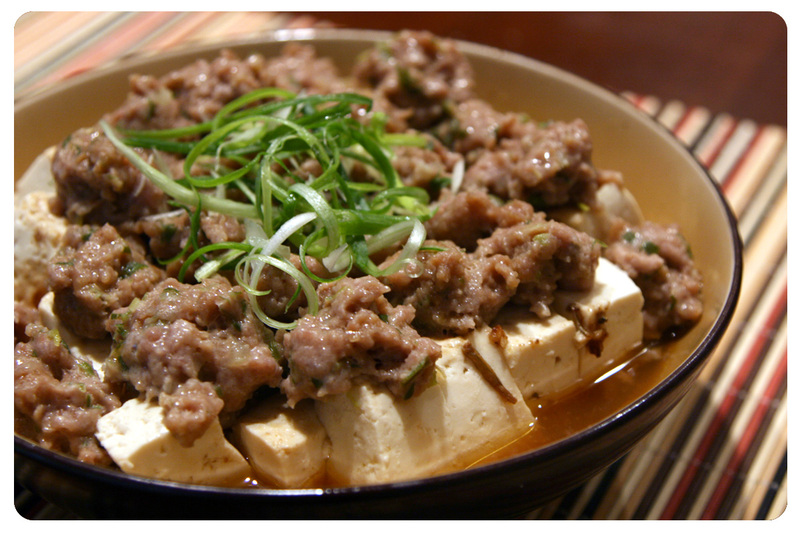 Then take the ground pork meat mixture, make mini meat balls and place them on top of the tofu. 4. Prepare the food steamer. I should note that I use a stove top steamer that has water filled at the bottom, so the cooking time may vary. Once the water comes to a boil, place it in the steamer for approximately 15-20 minutes (or until the meat is cooked). 5. Finish off by garnishing with green scallions. I’m definitely going to select one of your amazing recipes and give it a go. I’ll also make a post just like you (I never thought of doing that!) So I’m looking forward to this, and I can’t wait! I’ll follow up and let you know how everything goes (may not be for a while, as it’s a long weekend here in Canada). My whole family loved your recipe! Looking forward to more exchanges. I am cooking a crock-pot pork shoulder with Shiitake mushrooms for tonight, just burned my finger while stirring the soup. Well, hopefully it will turn out well. Super easy recipe to follow, will post it on the blog tomorrow! Have a good long weekend! Mmm, this dish reminds me of my grandparents and comfort food. I am bookmarking this recipe for a cold day, which could be tomorrow in San Francisco! This sound so good, and looks amazing! I Love the recipe! Thank you Sandra, definitely comfort food!